Bill Clinton may not fully realize this yet, but he's doing a great deal to help women with breast cancer by speaking about the wonderful benefits of a plant-based diet. He's lost a lot of weight and reduced his cholesterol dramatically, after heart surgery, by eating a diet based on whole grains, beans and vegetables. I listened to President Clinton speak recently in Maine and he mentioned with emotion that had his mother had health care coverage, she may have caught her breast cancer earlier and extended her life. Maybe so. I believe she also would have benefited greatly from understanding how much improving her diet can help. I believe many women with breast cancer would live longer and suffer less if they were given information about the affect of diet on their health. I'm grateful that a naturopathic doctor gave me this life-saving information 12 years ago when I had advanced breast cancer. In my opinion, every month should be Breast Cancer Awareness Month - not just October. So it's an excellent time to share information about this all-important subject. There is overwhelming evidence that estrogen levels are a critical determinant of breast cancer risk. In conventional treatments (which I had), doctors recommend lowering estrogen by taking drugs. Imagine if women (and men) also were given scientifically proven information they need to help them do this through a plant-based way of eating, too (or instead)? Better yet ... what if it were universally understood that eating a plant-based diet can help keep people from getting cancer? Lower the fat and animal food content of your diet and live longer. Women who eat a plant-based diet live longer than those who eat more animal foods. This is just one of the findings that came out of the research of Dr. James Hebert and his colleagues at the University of Massachusetts Medical School. Herbert showed that diet greatly influences whether a breast cancer will recur, or reappear, after it has been forced into remission after treatment. The study, published in the journal Breast Cancer Treatment (September 1998) found that consumption of foods high in fat, including dairy products, was associated with shorter survival among women with breast cancer. Butter, beef, liver and bacon are especially dangerous, Hebert found. Pre-menopausal women with breast cancer who ate butter, margarine and lard had a 67 percent greater chance of cancer recurrence than women who abstained from these foods. On the other hand, women who ate more plant foods tended to live longer. Simply eating more vegetables each day was associated with lower rates of recurrence, Hebert found. The women who ate the most vegetables had the fewest occurrences and lived the longest, while those who ate the fewest had the shortest survival on average. Post-menopausal women who ate broccoli, collard greens, kale and citrus fruit lived longer than those who abstained from these foods. Each additional 100 milligrams of vitamin C over the amount eaten on the standard diet reduced the risk of recurrence by 43 percent. Reduce excess calories to increase your chances of recovery. Another UMass study in the Journal of Breast Cancer Research and Treatment (February 1999) found that women who ate an additional 1,000 calories above their optimal calorie levels experience an 84 percent increase in the risk of recurrence. It's easy to get 1,000 extra calories by eating a few processed foods each day. Whole foods -- such as whole grains, fresh vegetables, beans and fruit -- are low in calories. A diet made up mostly of these foods is a low-calorie diet. The reason that calories are important is that the higher the calories, the higher the insulin levels and the greater the weight gain. Insulin is the hormone produced by your pancreas to make blood sugar available to your cells. Cells use blood sugar as their primary fuel. The more processed foods you eat, the higher your insulin levels. And the higher your insulin levels the greater your risk of recurrence. Many scientists now believe this combination -- high-calorie diet, overweight and high insulin, now referred to as syndrome X -- is the underlying cause of much of the breast cancer we see today. Estrogen can act like a growth hormone. The larger and more numerous the fat cells, the more estrogen a woman's body produces. Estrogen can trigger the over-production of tissue and inflammation inside the breast and uterus. This combination can block the milk ducts and the blood and lymph vessels within the breast causing waste products to stagnate. To keep your estrogen levels low, eat a high-fiber diet. Fiber acts like a sponge. It soaks up excess estrogen and eliminates it through the feces. High-fiber diets speed intestinal transit and promote elimination, thus keeping the blood and lymph cleaner -- which in turn keeps your breast tissue cleaner. Fiber is the reason that vegetarian women who eat lots of plant foods eliminate two to three times more estrogen than non-vegetarians, according to a study published in The New England Journal Of Medicine (1982). Plants are rich in healing compounds that fight cancer. For the person combating a serious illness, a plant-based diet -- based on whole grains, fresh vegetables and beans -- is an ideal cancer-fighting diet, according to many experts, including the Physicians Committee for Responsible Medicine. It is low in fat, rich in fiber and abundant in cancer-fighting chemicals. Proponents encourage people to eat organic foods, to avoid these chemicals, especially if you are attempting to overcome a serious illness. These foods, scientists have found, boost the body's healing forces, and directly fight cancer. The vegetables that appear most protective are the cruciferous variety, namely broccoli, cabbage, collard greens, kale, mustard greens and watercress. These contain the substance sulforanphane, which promotes detoxification of the blood and tissues and helps fight cancer. Another substance is phenethyl isothiocyanate (PEITC), which may inhibit the emergence of lung tumors in animals that have been bred to create cancerous tumors. Plants contain antioxidants, an antidote for oxidization, the underlying cause of most illness we see today, including breast cancer. (See Science Daily, Oxford Journals, and AACR Journals. There are thousands of antioxidants, though most of us know only the most commonly reported which are vitamin C, E and beta carotene. Plant foods are the primary source of all antioxidants. Without these, your risks of cancer rises dramatically, according to Bruce Ames, Ph.D., professor of biochemistry and molecular biology at the University of California, Berkeley, and a longtime researcher. Dr. Ames says that people who eat fewer than five servings of antioxidant-rich foods each day experience twice the risk of developing cancer than those who get five servings. Researchers have found that the body's primary cancer fighter, natural killer cells, are boosted in number and aggressiveness when anti-oxidant rich foods are eaten. 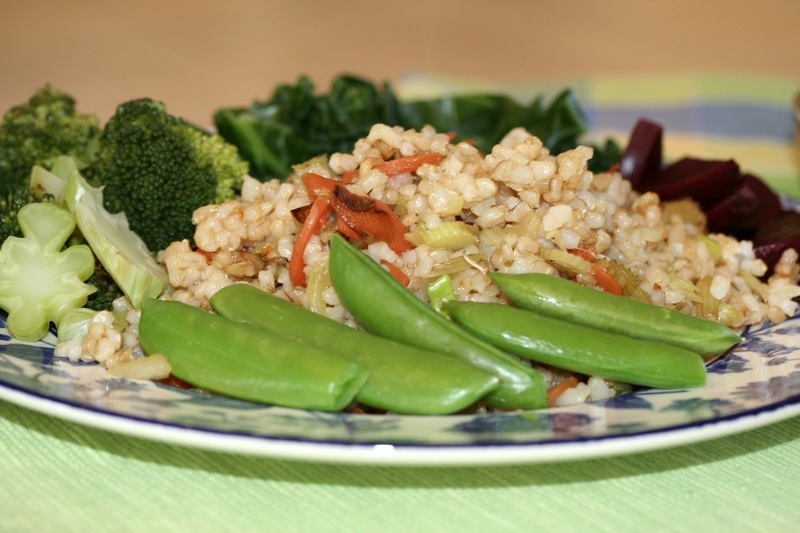 The Chinese, for example, eat a diet based primarily on grains and vegetables and they have lower rates of the common cancers, especially breast cancer. Two other groups of chemicals in plant foods known as carotenoids are also powerful cancer fighters. It takes a long time (too long!) for the science to get translated into treatment options. Though we have much scientific evidence about plant-based diet and good health, doctors do not commonly recommend dietary changes. Had I not learned about the impact of our diet on cancer 12 years ago, I'm certain I would not be alive and healthy today. More people need this information, as it is a key piece of the cancer "puzzle." Plant-based nutrition could increase the chances of long-term survival for so many more people! Want to learn more? ... I highly recommend reading The China Study, by T. Colin Campbell, a Cornell researcher in nutritional biochemistry who has done so much to raise awareness about the positive effects of plant-based diets. He conducted government-funded research about this vital link between diet and health for 40 years! Want to read about how to put this into practice? To learn how I went from near death to vibrant health, please read Becoming Whole, The Story Of My Complete Recovery From Breast Cancer. You can increase your chances of survival, too! For more quick and healthy plant-based recipes, please sign up for my free newsletter in the bottom right corner of my website.